The legacy of Harry’s Boots is part of a greater American history. For almost 80 years, Harry’s Boots has occupied the beautiful downtown storefront (spanning across 5 buildings!) in the sleepy Texas Hill Country town of San Saba. Over the last 8 decades the world around Harry’s Boots has changed dramatically, but our commitment to personal service, quality merchandise, and extensive inventories remains the same. Through good times and bad, the town of San Saba has stood strong. If you’ve ever visited our hometown, you know we have a true reverence for the past, with historic landmarks and restored buildings from long ago. We are literally surrounded by history. So, we want to take a look back at the state of the world when our store was first founded, back in the year 1939. It’s one of the most important years in American History, not only because of the birth of Harry’s Boots, but for many reasons. It was a year filled with joyous events, like the New York World’s Fair and Texas A&M winning the national championship. But, it was also a year filled with great tension, and events that changed the course of history, like the beginning of WWII and the Manhattan Project. 1939 was a year of transition, the rest of the world was on the verge of an all-out war, but America was staying out of it, and still healing from the Great Depression. The effects of the 1929 Market Crash and the following economic disaster were still prevalent, from big cities to rural towns. Spending any amount of money was a big decision for most families in 1939 America. Many people chose to rent a home (average rent was $28.00 per month) rather than buying (average cost of a new home was $3,800 dollars). Though jobs were on the rise due to FDR’s New Deal, they were still scarce. The average wage was $1,730 per year. It wasn’t until the U.S. joined WWII in 1941, that true economic recovery occurred. The Depression Era changed the way people shopped. Because of the need to dramatically cut costs, fashion in America had gone from ostentatious to practical. Harry’s Boots was founded on the principle that clothing, first and foremost, needed to be affordable and made to last. In July of 1938 the San Saba River flooded, and was the worst on record to date. Water spread into the business district, around the courthouse and covered over a third of the entire town, leaving more than 300 residents homeless. Crops, livestock, and poultry were drowned. Homes and businesses were ruined. Equipment, furniture and household goods were lost or destroyed. The cost of the damages was estimated to be upwards of $500,000 in San Saba alone, and between 1-3 million dollars in the surrounding San Saba County. So, you would assume, this was not the most profitable time to open a clothing store in San Saba. Not only was the town still recovering from the Great Depression along with the rest of the country, it was also recovering from the worst natural disaster in the town’s history. But in 1939, not even a year after the flood, Harry’s Boots opened to the public, providing the small town with friendly service and western wear for the entire family. And, in the face of true devastation, grew the thriving town you know today. Things weren’t going so well in Europe in the 1930’s. The Treaty of Versailles, meant to incapacitate those pesky Germans after World War I, served to only fuel the fire of Germany’s disdain for the Allied Forces. Extreme political groups rose to power at this time of unrest, in the name of German superiority. The most influential of these being Nazism. In 1933, Adolf Hitler claimed dictatorship over Germany, set up the Nazi regime and proceeded to rise in global and economic power. In August of 1939, Hitler invaded Poland, and this is considered the beginning of WWII. By September 1939, Great Britain and France had declared war on Germany. The Neutrality acts of 1935 & 1937, made it clear the U.S. didn’t want to get involved with any warring countries, and prevented any trade with belligerent nations, on both sides of the conflict in Europe. But, after the start of World War II, President Roosevelt proposed the Neutrality Act of 1939, which allowed arms trade with certain warring countries (aka U.S. allies, France and Great Britain). In November of 1939, the amendment was passed, much to the chagrin of the isolationists in Congress. In 1939, the U.S. was not directly involved in WWII, but anyone with any global awareness at the time, knew the tides of war were soon to reach American shores. There was an atmosphere of fear and apprehension throughout the country. With another great war on the horizon, the President, along with the greatest minds in America, began taking extreme measures in the advancement of weaponized technology. Uranium fission was discovered around the end of 1938, and this brought about study of nuclear physics. During this time, Hungarian physicist, Leo Szilard, concluded that this untapped power could be developed into a bomb, and deduced that the Nazis were already making moves in that direction. On July 2nd, 1939, Szilard, fearing the impending nuclear threat, met with another physics-officanando you may have heard of, named Albert Einstein. Together they wrote a letter to President Roosevelt, urging him to create a department within the U.S. government to develop nuclear weapons. Due to the chaos in Europe, the letter didn’t reach the President until October 11th, 1939. But, by October 21st, the Advisory Committee on Uranium was set up. This in turn lead to the formation of the Manhattan Project, which developed the first successful atomic bomb, changing the course of human history as we know it. In the 1930’s, baseball was considered the “Great American Pastime”, and the players were revered as gods among men. So, when baseball legend Lou Gehrig was diagnosed with a mysterious, incurable disease, it rocked the entire country. He had been signed by the New York Yankees in 1923 and played first base. At first his talent was overshadowed by the gregarious and charismatic Babe Ruth. But, by 1932 his batting skills had put him on the map, and he became the first player to hit 4 home-runs in one game. It was around 1938 that his health began to decline and he began to show symptoms of what is now known as ALS. In June of 1939, he was diagnosed with amyotrophic lateral sclerosis, which they named “Lou Gehrig’s Disease”. The incurable disease dismantles all motor functions, while the mind remains fully intact. So, on June 21st, 1939, Lou Gehrig announced his retirement from baseball. That year, on July 4th, Lou Gehrig Day was declared at Yankee Stadium. During the celebration, for the first time in the history of Major League Baseball, they retired a player’s number. Lou Gehrig’s #4 would never be worn again by another player. The idea for the 1939 World’s Fair was conceived during the height the of the Depression Era. The theme was meant to inspire an optimistic view of things to come, titled “The World of Tomorrow”. The grounds for the fair was a 1,200 acre ash dump, and was a not-so-subtle reference to the current state of America, having just gone through the Dust Bowl and The Depression. The dirty plot was transformation from a barren land into a futuristic utopia. The fair brought together different nations, civic groups, government agencies, and corporations from around the world. There were massive pavilions and exhibitions on display. Over the course of the fair’s two season run, over 44 million people attended. The 1939 World’s Fair was a symbol of light after a very dark time in American history, and it gave hope to people all across the world, that humanity was progressing towards a brighter, more united future. In 1939 technology was inspiring hope all across America, especially with the advent of televised broadcasting. It was during the 1939 World’s Fair that the first commercial television broadcast was unveiled. During the opening ceremonies, FDR came on screen and was the first televised president. TV sets were for sale to the public the next day. This was an extremely significant event in American history, because now the public could see the face of their leader. He was no longer just a voice in a box. The shared connection of watching the same thing as someone else, miles apart, profoundly impacted to the moral of a country that had been ravaged by poverty, and the isolation that comes from true destitution. The little glowing box in the center of the living room was a portal to the world. Americans were no longer alone. The first television broadcast was a step towards a future where everyone was able to participate and experience the world together. To this day 1939 is considered the Greatest Year in Film. When it comes to the high quality and sheer amount of films released that year, as well as the huge attendance at theaters across America, no other year compares to 1939. The world was in chaos, the wounds of the Depression were still very raw, so people needed an escape, and Hollywood came to the rescue, big time. One of the most popular films of all time, The Wizard of OZ, premiered in 1939. The tale of a girl who escapes life in Kansas, located in the heart of the Dust Bowl, and enters a magical world, transported the audience out of their everyday lives. The film was met with immediate acclaim and was nominated for Best Picture at the Academy Awards. Judy Garland, the star of the film, was thrust into immediate stardome, and the song “Somewhere Over the Rainbow” topped all the music charts. The Wizard of Oz was beat out for Best Picture by the classic film, Gone With The Wind. Which was directed by Victor Fleming. Who, by the way, also directed Wizard of OZ. 1939 was a banner year for him as well. Gone With The Wind premiered on December 1939, in Atlanta, Georgia. It followed the life of Scarlett O’Hara, set in the American South around the time of the Civil War. The film took home eight Academy Awards, including Best Supporting Actress, making Hattie McDaniel the first African-American to be nominated for and win an Oscar. Before the release of the film Stagecoach, not many knew the name John Wayne. The film is considered his breakout role, where before he was considered a b-list actor, not a legendary leading man. Stagecoach was released in February of 1939, and became an instant classic that transcended the western film genre. It wasn’t just a shoot-em-up adventure in the desert, it was an in depth analysis of the human condition. The film revolved around a group of strangers, brought together on a treacherous stagecoach journey through dangerous lands. Through good times and bad times, San Saba has continued to be an oasis of peace in the Texas Hill Country. Today it’s a destination for history buffs, pecan lovers, wine drinkers, and anyone who enjoys the charm of the small town living! We are proud of our community and all the local businesses that neighbor our shop. And if you decide to take a stroll down the road from the Wedding Oak Tree, to the old San Saba Courthouse – you’ll experience the most authentic western town of our beautiful Texas! If you do want to experience the past first-hand, come visit San Saba, we’ve got historic walking tours, amazing shops & wineries, and so much more for the history lovers. And, don’t forget to stop by Harry’s Boots and say hi! 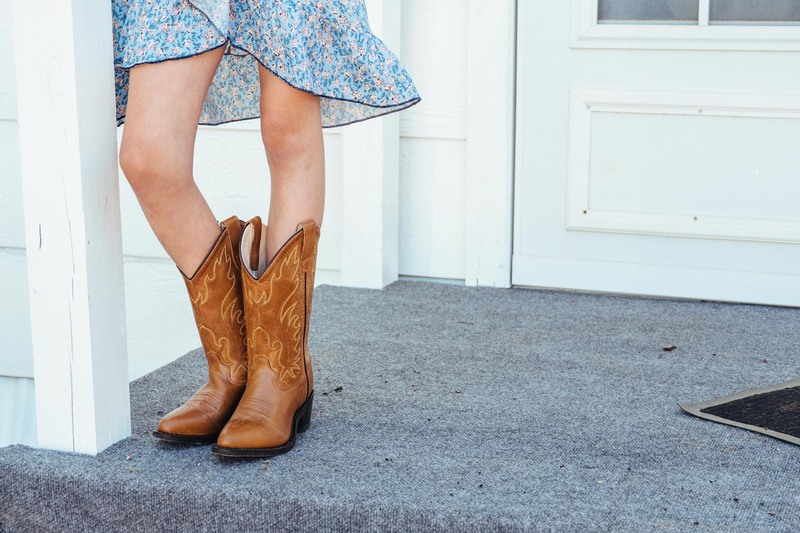 WE CAN’T BELIEVE HARRY’S BOOTS HAS BEEN PART OF SAN SABA FOR OVER 78 YEARS! And, we can’t wait to see what the next 78 years have in store for us!